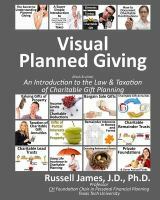 You wouldn’t expect a book with the subtitle, “An Introduction to the Law & Taxation of Charitable Gift Planning,” to be accessible, but that is precisely what Visual Planned Giving is. Each succinct paragraph has an accompanying image (photo, cartoon, chart, etc.) with a detailed caption. Oftentimes, the image and caption are all the information you need to understand the topic. This is the kind of book that you can open to a random page and learn, say, the basics of tax law or perhaps, the benefits of an Irrevocable Life Insurance Trust. To reinforce what you’ve learned, there are fifty pages of quizzes and answers. If charitable gift planning is your topic, Visual Planned Giving is a great way to learn a lot in a little time. An illustrated guide to charitable gift planning.